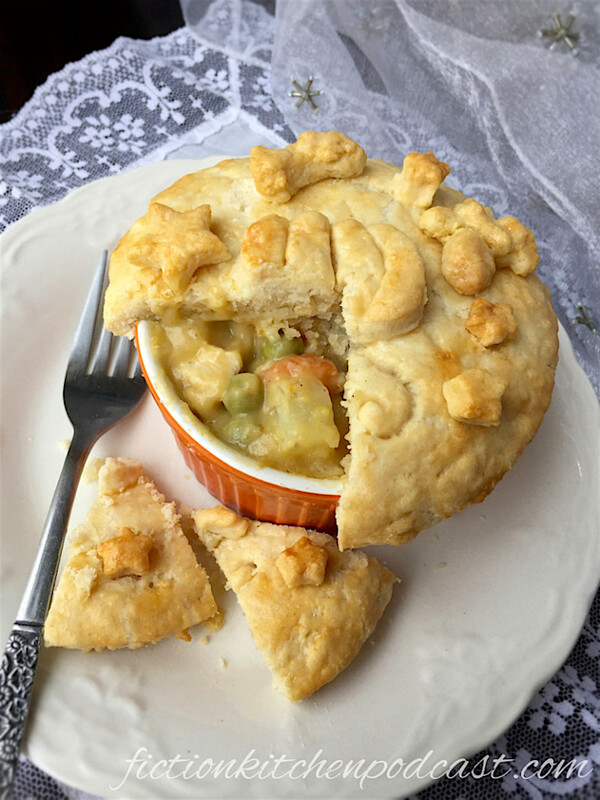 This recipe is inspired by the scene in the 2015 live-action Cinderella film in which Cinderella is given a plate of a few left over peas, carrots, and diced potatoes, as well as the pot pie I ate from Denny's directly after seeing the movie. 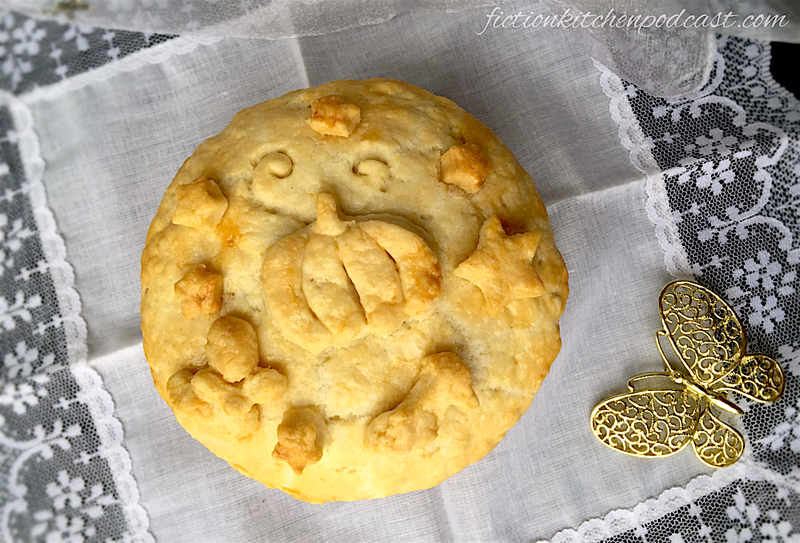 I included pumpkin puree because, well, pumpkins and the commonly known Cinderella tale go hand in hand! Note: As discussed in the podcast, Cinderella may be vegetarian (I mean, she can kinda talk to animals...) so feel free to make it vegetarian by omitting the chicken from the recipe below and using vegetable broth instead of chicken broth. The pie crust recipe used is from Martha Stewart Test Kitchen. Crust: Freeze 3/4 of the butter pieces on a parchment-lined tray & put the rest in the fridge. Combine the flour, salt, & sugar in the food processor & then add in the butter from the fridge & pulse a few times. Next, add the freezer butter & pulse until crumbly. Add the ice water & pulse again until dough forms & sticks together. Ball the dough together & place it on a large sheet of plastic. Loosely cover it with another sheet of plastic & then flatten it uniformly with a rolling pin. Wrap it up & refrigerate for at least 30 minutes. Filling: In a large pot, melt the 4 tablespoons of butter & whisk in the flour. Add the evaporated milk & whisk to combine. Next, whisk in the broth & pumpkin puree & bring to a boil. Turn off the heat & stir in the rosemary, sage, salt, & pepper. In a separate pot bring the water & carrots to a boil & boil for about 5 minutes. Add the potatoes, onions, & optional chicken & boil for another 5 minutes until tender. Drain well & fold into the creamy mixture along with the peas. Building & Baking: Preheat your oven to 400ºF. Roll the dough between the sheets of plastic (unwrapped) to about 1/8" thick & overturn a medium-large ramekin onto it. Cut the dough around the rim so you end up with a dough circle that fits over your ramekin. This recipe can make about 4 ramekins worth of pot pie so cut more dough circles for your ramekins as needed (alternately, you could make a large, deep-dish pie if you wanted). Scoop the pot pie filling into the individual ramekins & top with the dough circles, curling the dough edges under the ramekin rims. With the left over dough, re-roll to 1/8" or slightly less thickness & cut into various shapes that go along with the film/fairytale like pumpkins, butterflies, fancy shoes, etc. & place those shapes on top of the dough-covered ramekins (use a tiny bit of water to help the pieces stick if needed).